Thorpe's Body & Corvette Shop has been doing business for over 35 years. Tim Thorpe and his team are experts in auto restoration, specializing in Corvette's and muscle cars. Tim is a certified expert in Corvette restoration, judging and authentication. The shop serves customers from all over the nation and has had numerous articles in national magazines highlighting their work. Thorpe's Body & Corvette shop has earned special recognition from leading manufacturers of model replicas of classic cars including the Franklin Mint and Ertl. Tim's cars were selected as THE models from which these replicas created. Thorpe & his team are not only experts in Corvette restoration, but also muscle cars, other classic cars and trucks, and any auto restoration. The shop is located in Southern Illinois in O'Fallon just east of St. Louis, MO and serves customers from all over the country and is consistently listed by Corvette Fever magazine as one of the best, most trusted Corvette restorers in the country. 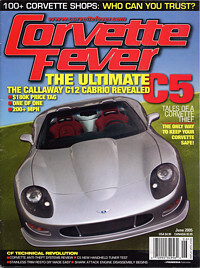 One of Tim's cars is currently featured on Corvette Fever magazines website. The uber-classic monster, the Corvette L88. Of the 216 made from 1967 - 1969, Tim and his team have restored 45 of them back to pristine condition and performance.